The spread of environmental toxins risks becoming a rapidly growing problem for us and for future generations if we do not ask for a poison-free society.The Nordic eco-label sets tough demands on harmful chemicals. The goal is to create an environment safe for human health. Our society causes various toxic pollutants released into the environment in several ways. the production of food, clothing electronics, toys and many more of the things we use in our everyday lives. from drains, accidents are often to fix. The fugitive emissions, however, may be more difficult to access. from products throughout their life span, they are disposed of – collected so they can be reused. ISO certification certifies that a management system, manufacturing process, service, or documentation procedure has all the requirements for standardization and quality assurance. ISO (International Organisation for Standardization) is an independent, non-governmental, international organization that develops standards to ensure the quality, safety, and efficiency of products, services, and systems. 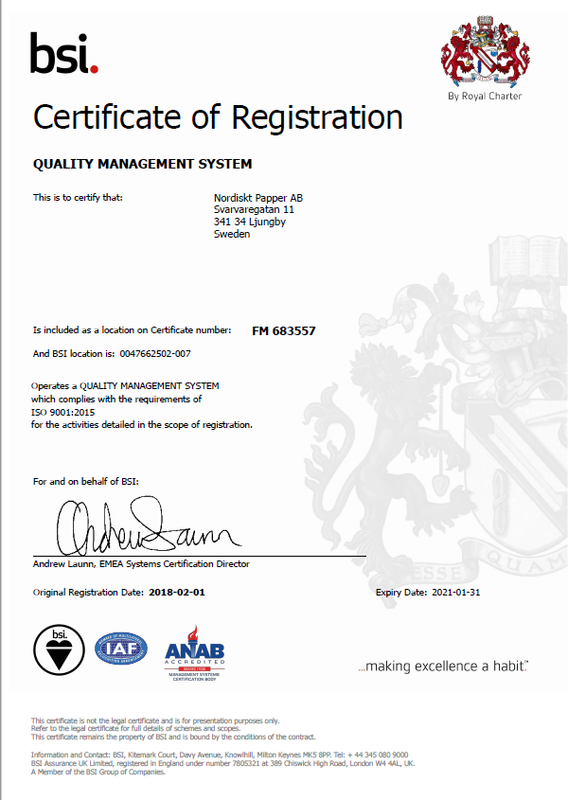 ISO certifications exist in many areas of industry, and NPA Nordiskt PapperAB is ISO 9001 and ISO 14001 certified. ISO9001 is the title of an ISO standard that outlines the requirements an organization must maintain in its quality system. ISO14001 is standards related to environmental management. FSC stands for the Forest Stewardship Council and is an independent international membership organization that works for environmentally-friendly, social responsibility and economically viable use of the world's forests, through its FSC certification system. Certified companies comply with FSC's rules (standards) for forestry and traceability. For those who follow the rules youmay notice their products with the FSC brand. The FSC brand allows consumers and businesses to choose wood products that come from responsible forestry, that is, forestry that takes into account people and the environment. An environmental declaration document provides information on the paper's unique characteristics: the product's ingredients, energy consumption, emissions to air and waste management and facts. Procurement often sets very high standards of the documentation; we have therefore developed a detailed document that will help you. Above you can see examples of environmental declaration papers as well as a specification of a municipality in Sweden.